I’m so excited to be writing my first blog post! I am hoping to write a post every day or so. Today was pretty much my usual day. Get up, eat breakfast (cereal today because I forgot to get my overnight oats ready last night) and head to work. I am in a Technical Writing Class this week which is surprisingly interesting! I am hoping that I am learning some new techniques to improve my writing skills. One of the toughest skills he has been trying to drill into our heads this week is what he calls “slopping”. He says that when you want to write something you should sit down at the computer and just type for 6-8 minutes without stopping to think about what your next sentence should be or going back to correct mistakes. After that 6-8 minutes you can go back and make whatever tweaks you might want to make. Stopping distracts you from your original thoughts and makes writing more difficult. Sounds like a simple concept, but it is actually much harder to sit and continuously type without correcting your errors. I am also enjoying the class because he gives out books when you say something intelligent or ask him a question that helps him teach the class. For my prize I picked out the book The Help, which I hear they are turning into a movie. Hopefully I can finish the book before the movie comes out. After work we came home and I made a quick dinner while Karl did a little picking up around the house. Tonight’s dinner was a simple veggie stir fry of onions, bell pepper, broccoli, carrots, cucumber, and chickpeas served with quinoa. Karl and I just tried quinoa about two weeks ago, and we are in love! Before we would’ve served the stir fry over spaghetti or brown rice, but I like knowing that we are eating a much healthier grain and getting some protein as well. Most of the time we would make a stir fry sauce from scratch, but since I was trying to get things done quickly I used a light amount of store bought sauce. 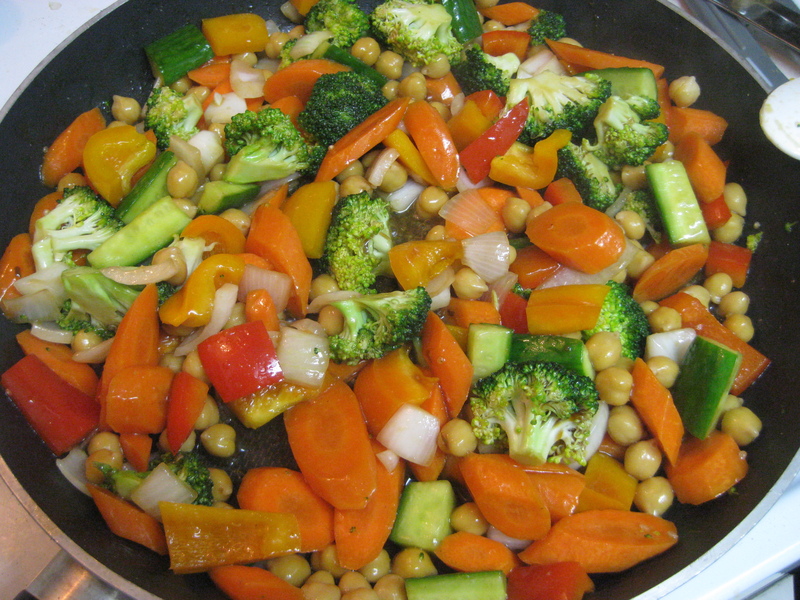 Stir fry is such a simple dish, but it is definitely one of my favorite ways to get in so many veggies! I love the beautiful assortment of colors on the plate. Thirty minutes later we were out the door on the way to the gym. One of my favorite classes to take is Les Mills Body Combat which our gym offers on Monday, Wednesday, and Friday nights. The Monday/Wednesday instructor is just amazing. I love that she knows me by name and tonight, since I hadn’t been to the gym in awhile, she asked me where I had been. It’s really good for me to have someone other than Karl who holds me accountable for my workouts! She is something like 3 months pregnant and still going strong. I’m not sure what I’m going to do when she has to take a maternity leave! After the gym we headed to the store to stock up on a few of the necessities, including one of my favorite fruits of the summer, watermelon! Eating a big bowl of watermelon is definitely a good way to hydrate after a tough workout. Making the hummus is very simple! 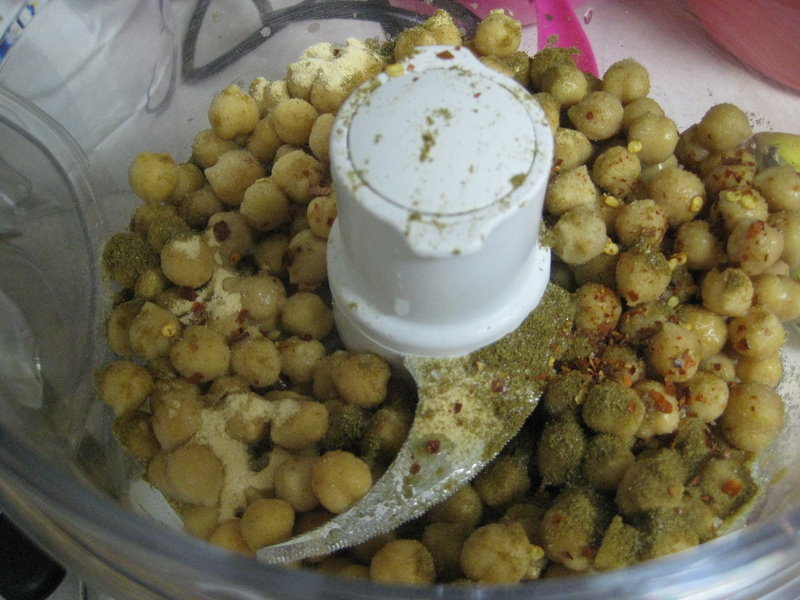 First, drain the chickpeas, reserving 1/3 cup of the liquid. 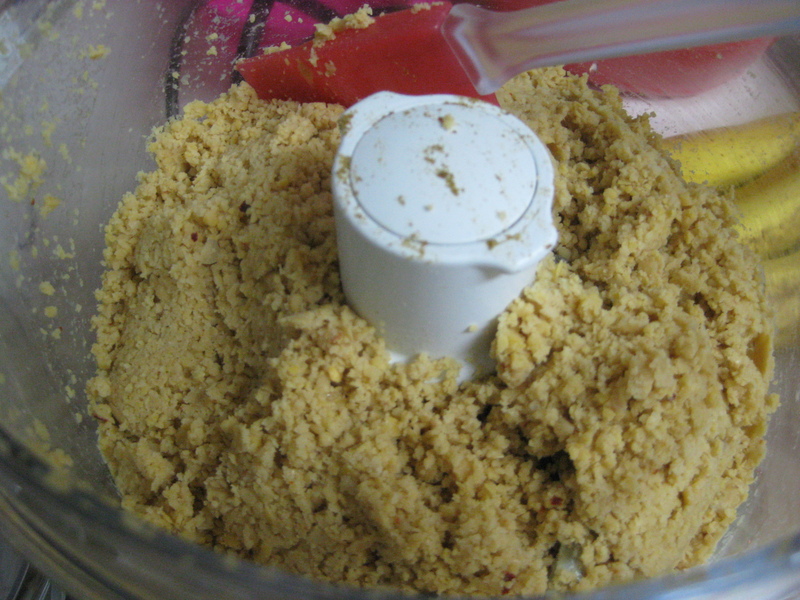 Throw the chickpeas, garlic, lemon juice, cumin, crushed red pepper, and salt into the food processor and process until it starts to get smooth. Then drizzle in the reserved chickpea liquid and continue to process until you see a smooth consistency. 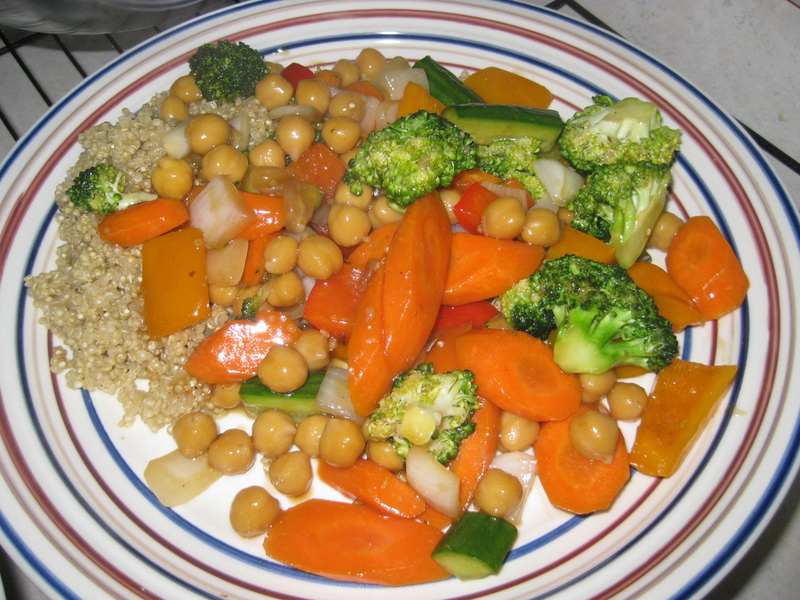 After I had added all of the chickpea liquid, I still wasn’t happy with the consistency – it was a little gritty still. So, I decided to try drizzling in some olive oil while continuing to process the hummus. I probably added about 2 more tablespoons oil when it started to look right. Then it was time to try it. And, I was very unimpressed! I’m not sure if it is the strong chickpea flavor or the seasonings, but I do not like it at all. I’m wondering if there is a different recipe out there that I might like better. If you have a better recipe, please share it with me! I’ve also seen some black bean hummus recipes, and, since I am a bigger fan of black beans, I think I will try that sometime in the near future as well. I’m going to throw the hummus in the fridge and see if I like it any better when its cold. Well, that’s it for today. Time for some much needed sleep!